Scythrididae was designated as a subfamily, Scythridinae, of Xylorictidae by Hodges (1999). A generic revision of Nearctic Scythridinae (as Family Scythrididae) was published by Landry (1991). Larvae of the relatively few scythridine species for which life histories are known show a preference for feeding (usually internally, e.g., as leaf miners) on composites (Asteraceae). Scythridinae is one of the few gelechioid groups (along with, e.g., Agonoxenidae) in which the larva bears secondary setae. 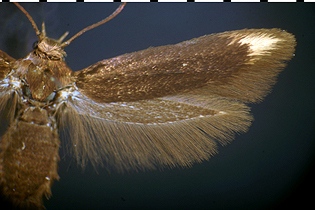 Adult scythridines are small brown moths; some species are so dark as to appear black or blackish to the unaided eye, and some species have one or more whitish patches on the forewing. 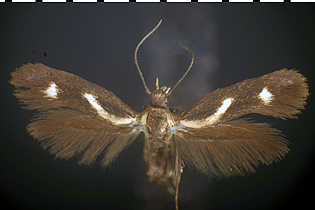 Adult scythridines are diurnal and seldom are attracted to light. In Illinois, they show an affinity for nectaring during the day on flowers of yarrow, Achillea millefolium (Asteraceae) when it is in bloom. Some scythridines appear to be associated with sandy areas. Rhamphura sp. (Fig. 1) feeds as a leaf-skeletonizing larva on thistle, Cirsium sp. (Asteraceae). In central Illinois, the mature larva occurs in early to mid-August, with the adult emerging in late August or early September. The rather striking coloration of the larva of this species is different from that of the leaf-mining species covered below, larvae of which are uniformly whitish. Figure 1. Rhamphura sp. Adult, and leaf-skeletonizing larva on thistle, Cirsium sp. (Asteraceae). 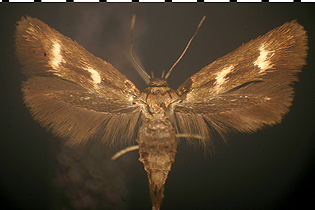 Thanks to Dr. Jean-François Landry for identifications on the following three moths. Landryia impositella (Fig. 2) is a leaf miner on heart-leaf aster, Symphyotrichum cordifolium (formerly Aster cordifolius) (Asteraceae), a plant of deciduous forest. Multiple mines and larvae occur on each infested leaf. The larva matures in September and overwinters, with pupation and adult emergence taking place the following spring. All scaled surfaces of the adult bear a strong coppery sheen. Figure 2. Landryia impositella. Adult, reared from leaf mine on heart-leaf aster, Symphyotrichum cordifolium (Asteraceae). The moth in Fig. 3 is likely also Landryia impositella. As with the moth covered immediately above, it is a leaf miner on heart-leaf aster. It differs in that the leaf mine is solitary (one mine and one larva per infested leaf), and the larva matures at the end of June and pupates straightaway, with the adult emerging in mid-July. The coppery reflections seen in the previous moth are absent in this form, but apparently it is an extremely variable species, such that all differences in color and markings seen in these two entities are within the realm of intraspecific variation. Figure 3. Landryia impositella. Adult, reared from solitary leaf mine on heart-leaf aster, Symphyotrichum cordifolium (Asteraceae). Scythris basilaris (Fig. 4) is known in Illinois from sandy areas, where the adult has been collected diurnally on flowers of yarrow, Achillea millefolium (Asteraceae), in mid-June. Figure 4. Scythris basilaris. Adult, collected diurnally on flower of yarrow, Achillea millefolium (Asteraceae). Scythris immaculatella (Fig. 5) has been collected as a diurnal adult in Mason County, Illinois, on 19 June (male individual, determined by dissection). The images shown here were very kindly provided by Dr. Jean-François Landry, who writes, "these are the only known photos of [a live individual of] this species. Photographed at Lac Brûlé, Quebec, 2.vii.2003 on Rudbeckia flower planted along the cottage house. The cottage borders a mixed forest with moss-covered boulders. Larvae of S. immaculatella most likely feed on mosses." Figure 5. Scythris immaculatella. Adult, photographed by Dr. Jean-François Landry at Lac Brûlé, Quebec, Canada; moth nectaring on flower of Rudbeckia sp. (Asteraceae).